I found these cute little silver-plated salt and pepper shakers at the Salvation Army the other day. They were tarnished and I polished them but I think they actually looked better tarnished. The good thing is that I know they will be tarnished by the time I want to use them. I'm not going to use them as salt and pepper shakers but as Christmas ornaments. I tied on some red ribbon and I think they will look adorable hanging on my Christmas tree! One year awhile back I had 2 Christmas trees, one in my living room and the other in my dining room (I had a bigger place back then.) I hung blue and white transferware cups and I attached saucers with plate hangers and wire. It was adorable. I would love to start collecting little things to do a tea-themed tree like that again someday. It's just another thing I'll be on the lookout for at the thrift stores! After my daughter and I had dinner last night on our patio, I started painting another rose I made. She wanted to paint too so I got out my art supplies. It was so nice sitting there painting and chatting with her. As she was painting she said that she's not artistic like me or her brother. I disagreed with her on that and told her she just needs to spend a little more time with it. She got bored painting so she grabbed the camera and took a couple pictures, one of which was the colored pencils sitting on the table. Now, if that's not an artistic photograph I don't know what is! See Lauren...you are very artistic! I love the little salt and pepper set. So cute! What a find to add to your Christmas ornaments. I would love to do a tea-themed tree in my dining room but there is no room at all for a tree. There's too much traffic through the room and only one corner that is taken up with my corner hutch. You're right - your daugther IS artistic. Her photo proves it. The sweetest idea...ornaments! I have so many things on my tree that did not start out life as actual *ornaments* but are just perfect! The pencil photo shows she has a wonderful eye...talent runs deep in your family! Tell your daughter the photo is fantastic! 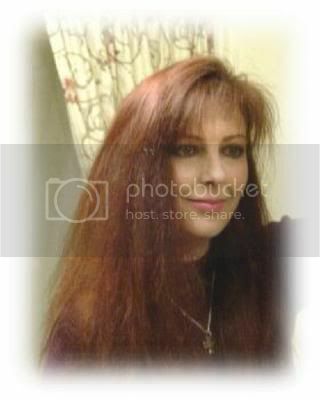 It is an art form to be able to know how to compose a photograph and she did a wonderful job. Very cute find again! I love tarnished silver too. How nice to have dinner outside and time just playing with your daughter. Everyone is right she did a nice job with the photo...that's a talent knowing what makes an interesting shot. 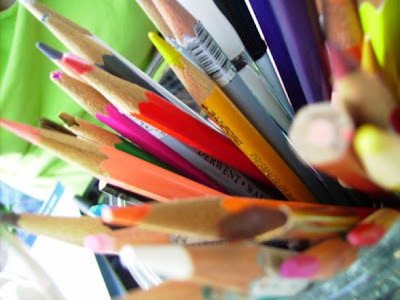 I agree with you--a very artistic and lovely picture of colored pencils. Good enough to make a greeting card out of! Love the idea of s&p shaker ornaments. Love the little salt and pepper. I usually put up a small tree in our breakfast nook. 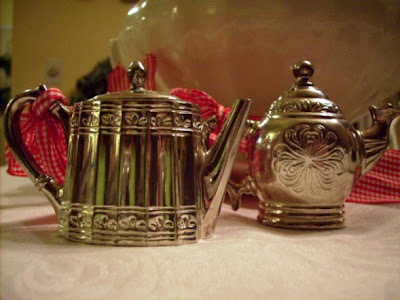 I tie silver flatware, teapots, creamers etc. with pretty ribbon or tulle. It adds some Christmas to the kitchen. It seems your daughter has a gift for photography! That's a great photo! I love using different things for ornaments too....... I have a small "tea" tree for our dining room. Those will look adorable on a tree. Your paper roses are looking fabulous. I still need to try this before I use up all the coffee filters ;-) Yes, the colored pencils--definitely artistic! Those will be lovely hanging on the Christmas tree- what a wonderful idea. Do you use much silver at Christmas? I know I do- I love everything to sparkle! I used to have a 2nd tree in our bigger house. It was a travel tree, holding ornaments from every place we had vacationed. I always wanted to do a small kitchen tree as well. I can't wait to see everyones Christmas ideas and decor this year! Also - it IS a huge talent to see through the eye of a camera. My Emily has that talent. Every picture I have ever had blown up into a poster, she took! The Mini Teas are adorable and will be sweet on your tree ! Your daughter does have a flair, Composition is a huge part of art. That photo is VERY artsy... It shows a very good eye for color and all that! Your tea tree sounds so cute. 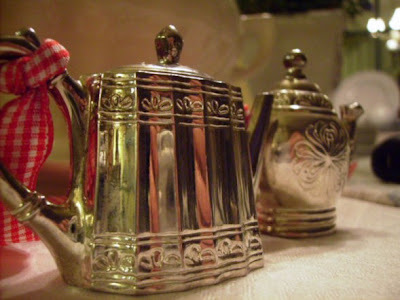 A few years ago, I found the most wonderful sterling silver water pitcher, it was really tarnished, but I liked how it looked. When I added pink roses and other pink flowers, it looked stunning. I love the little salt and pepper set too.Your time with your daughter sounds so lovely...my daughters are always working crazy hours it seems, so there is not much time to just relax together. The little salt and pepper shakers will make darling Christmas tree ornaments. I love your daughters photos of the colored pencil. Your daughter's photo is wonderful -- great composition and color and movement: the pencils look like they are absolutely bursting from the holder! I love your idea about the theme tree. I always do a miniature tree in the kitchen, hung with small spoons and bread knives and sugar tongs -- anything silver and tarnished and kitcheny! I do several trees - one large tree and then a medium size and a couple of small ones. LOL!! I did a smallish one in the kitchen last year - stood it in a crock and used two ribbons (blue and white) one was gingham the other polka-dot and tied antique cookies cutters all over the tree. It was adorable! The salt and pepper shakers will look great on a tree! Darling salt and pepper set. They will be so cute on your Christmas tree. A few years ago I did a tree for our local Festival of Trees out of blue & white transfer ware too. I wish I would have thought to put the plates in plate holders to hang them, great idea. Those are just *adorable*. I turn just about any small, cute, hangable thing into a Christmas ornament! Your daughter definitely is artistic! There are so many ways to express one's creativity, whether its through traditional mediums, cooking, gardening, photography, writing..the list goes on! Love your outlet find! Those are gorgeous!